The human body is vastly complex, comprised of several ‘systems’. Some are commonly known, others less so. 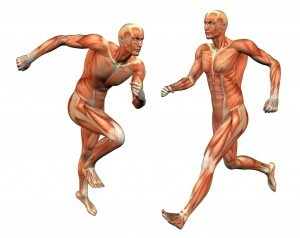 Today we take a look at one of these systems known as the Myofascial system. Most people understand the make up of the body as a series of muscles, tendons and ligaments attached to the skeleton, all surrounded by skin and protecting the vital internal organs. In this blog I aim to challenge the belief that muscles are individual and can operate in isolation and to explain why we (at APA) train our athletes predominantly in compound exercises. The term Myofascial refers to the unit comprised of muscle and connective tissue. Myofascial meridians join the bones, muscles, tendons, ligaments, and connective tissue throughout the body in a web-like chain covering the whole body from the ground up to the head. The connective tissue is what connects a chain of muscles together. The muscles could and should be viewed, not as lots of individual muscles attached to bones, but as a single muscle running from head to toe that attaches at many points in order to allow movement. Indeed muscle is not even attached to bone directly but through the connective tissue – fascia. All too easily, however, we are seduced into the convenient mechanical picture that a muscle ‘begins’ or originates here and ‘ends’ or inserts there, and therefore its function is to approximate these two points. This is certainly how it is taught throughout academia, perhaps for simplicity, however a deeper understanding of the connective tissue enables the S&C coach to better plan and articulate training programmes. The fascia acts as a ‘double-bag’ surrounding the bones, cartilage, and synovial fluid in the inner bag, the periosteum and ligaments forming the inner bag. The muscle fibres being in the outer bag, with the outer bag itself being formed of structures called fascia, intermuscular septa, and myofascia. 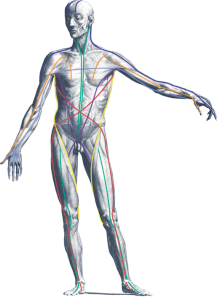 In total all the bodies structures are connected via fascia, this can from time to time cause problems when one area is placed under stress or trauma, there is likely a chain reaction to another connected part of the body. However it can also work in the advantage of the body with the ‘transfer of tension’ enabling some outstanding feats of strength and athleticism. The principle researcher in the area of Myofascial meridians for many years has been Thomas Myers. Myers’ talks about the influence of injury on the fascial system with an analogy – if a tree falls on the corner of a building, the corner collapses but the building can remain intact. 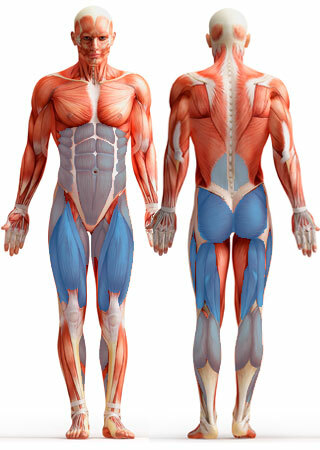 Much treatment therapy of the body operates with this view of the body – fix the broken part. If one looks at the body as a tensegrity model, however, the entire structure will give when a stress is applied in one corner. “Load it too much and the structure will ultimately break”. Ultimately the strain placed on a structure is distributed throughout that structure and the tensegrity of the structure may have a weak point, which I likely to be the place of collapse or in the human body, point of pain. 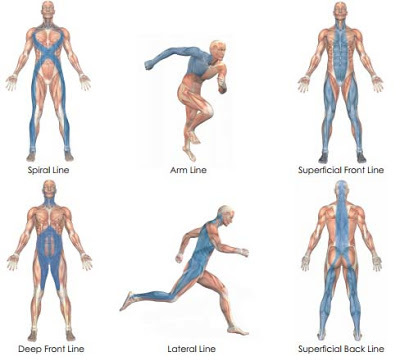 Within the human body there have been several ‘lines’ of fascia identified (sometimes known as sling systems) as shown in the diagram. Athletic movements are dynamic by nature and utilise many if not all of these lines when performing sporting actions such as running, throwing, jumping, kicking a ball or swimming. It is important therefore that we as strength and conditioning coaches consider the implications of the training we administer to our athletes – ultimately the goal of which is to improve performance and reduce injury risk. Compound movement training is nothing new, but it is something we advocate highly at APA. Our athletes from a young age are taught strength exercises such as how to squat, lunge, push and pull. With sports such as tennis being multi-directional and explosive, we also focus on teaching landing mechanics, jumping mechanics, change of direction mechanics and Olympic lifting techniques. . Compound exercises are an excellent way of getting the body to utilise many of the lines or sling systems of fascia in the body to stabilise movement, produce power and decelerate the mass of the body. As our athletes develop, the early teaching of compound movements such as squats or Olympic lifts will gradually become loaded exercises. Thus enabling us to strengthen the entire chain of the body; myofibrils, connective fascia and the nervous system that feeds them in order to improve athletic performance. Once an athlete has fully developed, the intensity of the training they complete will be the increasing factor, designed to replicate the stress placed on them during competitive situations. There has long been a discussion about training athletes in the specific movements for their sport. The methodology used at APA is to establish a fundamental athletic base from which sport specific training can be added onto. Our predominant athletic population is tennis players, however many of our young players (5-12yrs) will play various other sports alongside tennis, until they choose to focus on one sport. We encourage young players to participate in many sports whilst they are still developing the cognitive and proprioceptive skills needed. However as APA operates in a tennis environment, we train and improve the movements specific to tennis alongside gross motor skills and compound athletic exercises. One of the primary reasons for compound exercises being used is the range or extent of muscles used as part of the exercise and the cross-over or translation to movements within sport. Examples of which can be found in the Olympic lifts – primarily challenging the superficial front and back lines – which focus on taking the body from a ‘triple flexed’ position to a ‘triple extended’ position under load. 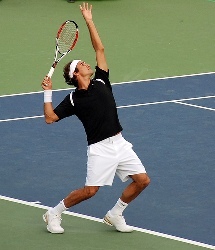 A not too distant example of a sporting move is the serve in tennis, although the added rotation and implements of the racquet and ball make it a more complex skill to complete, the muscular actions are very similar. The superficial front and back lines are predominantly used for both running and squatting. Throwing and kicking a ball also challenge connective fascial systems and so benefit from training the lines and muscles used in each action, such as squatting, lunging, pushing, pulling, rotating and overhead pressing. The lateral and spiral lines are both involved in actions requiring a degree of rotation. As you can see in all the photos above the body is being placed under severe mechanical stress and it is the fascia and connective tissue that is holding everything together. Without compound training, the myofibrils of the muscles would be the primary target of strength training as in isolation exercises such as leg extension or bicep curls. By training compound movements we are improving our athletes’ whole body and everything that goes into physically performing an explosive task. If you are interested in using APA to help you improve your athletic performance please get in touch. If you missed Part 1 read it here. In Part 1 I gave a summary of the 1 hour presentation I gave to a group of 14 coaches, where I discussed the underlying qualities we should be looking to develop in our athletes which will go a long way to developing overall athleticism. We wrapped up the presentation by bringing together all the previous biomotor abilities into a warm-up method. By doing a comprehensive warm-up you can prepare your body and mind for your speed session and at the same time put some extra work into developing your suppleness and your skills of balance, coordination and reaction speed. We looked at different exercises we could use to develop these abilities including using a skipping rope, bands around the thighs for hip work, crawling patterns as well as performing locomotive tasks across the ‘width’ of the court to develop coordination. After the warm-up we were now ready to get Fast and do some speed work! Do you have a picture in your head of what that perfect movement should look like? Again Kudos goes to Duncan French who reminded me that while we can’t always have an instance impact on a lot of the qualities such as Strength and Rate of Force development that cause motion (these require training), there are still aspects of movement we can improve simply by coaching the athlete into a better position. Asking an athlete to get lower -centre of gravity (COG) or wider- base of support (BOS) is something they might be able to be cued on without them having got stronger. They just became more aware. So a lot of importance should be put on coaching athletes into correct positions NOT just motivating athletes. Coach it- don’t just motivate it! I introduced the 3 types of Speed that we focus on at APA described above- namely Straight ahead, First step and Multi-directional Speed. We also talked about Footwork which for simplicity I refer to as a specific type of multi-directional speed in tennis. Then the first thing I wanted to remind the coaches of was the importance of a good evaluation before getting into whatever drills you plan on doing. This can be a formal ‘fitness test’ at the start of a new working relationship but should also be part of an on-going training process of constant evaluation of the athlete. In any given task I said they needed to know what the outcome was and what the process was to achieve it. The outcome is your ‘Final Skill’ and when it comes to speed it can be associated with a clearly defined timed measure of success such as running 20 metres in under 3.00-seconds or a pro agility 5-10-5 shuttle in under 4.5 seconds. But remember we are playing sport so in tennis it could be feeding a ball so it lands in a certain area of the court and expecting your athlete to be able to hit it back! We started off with looking at the Target mechanics of Straight Ahead Speed. I suggested that for tennis I typically encourage all athletes to do at least some work to develop basic sprinting technique but it has increasingly less importance as the athlete begins to specialise in Tennis since there is no reaction to a visual stimulus. Apart from the reaction to the starting gun it is a very closed skill. We started by discussing how you could evaluate Straight ahead Speed (SAS). I said there needed to be an outcome so in this case that might be time based- sprint 5m in under 1.00 second (acceleration) and 20m in under 3.00-seconds (more top speed). The process could be to sprint the first 10Y in 6 steps with a positive shin angle and 45 degree forward lean at the point of contact of the foot with the ground on the first step. I typically observe and EVALUATE performance FIRST using a chaos situation where the movement is being evaluated in an open environment. 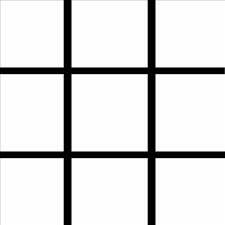 This can be a sports related game (such as a relay race in the context of SAS) or a drill which involves multiple speed qualities such as an obstacle course so that the qualities have to be applied under a bit of added challenge. Then depending on what I observe I will first cue the athlete to see if they can correct their body position. If they can then I can go into more challenging drills and simply TRAIN that movement with more COMBINATIONS of skills such as a side shuffle into a sprint and reaction to a signal known as RANDOMISATION, or more INTENSIFICATION by using resistance from a harness or a partner etc. If they can’t correct it then maybe they lack some other qualities such as suppleness, strength or skill but it’s most likely a combination of all three and simply by putting some constraints in the environment and giving them some good feedback on what they are doing you can correct their positions. This may require that you close the drill down into a simply closed drill with no added pressure- an ISOLATION drill. This is where (wherever possible) it is a great idea to use the tennis coaches to create a realistic open scenario ON THE TENNIS COURT to evaluate the performance. We set up the drill as indicated below so that the person receiving the ball from the coach (Player 1) was working on his first step speed (Lateral) and the opponent receiving the ball from the player on the next shot (Player 2) was working on his Multi-directional speed. Don’t get hung up on this. As long as they are dropping their centre of gravity towards the base of support then everything will work out. If you feel they are not using the step you want then put some constraints in place such as the starting position of their feet or the speed, or height of the ball that they have to catch and the body will solve the problem!!!! Then we discussed First step Speed (FSS) forward and backwards. I said to the coach that there similar debates about this. In Tennis we recognise the principle of Newton’s Law of Opposing Force so in order to go forward they will push directly back using a dig step when we don’t anticipate the forward movement. However, if I know the only direction I will be asked to move is forward then yes, a forward step into the court without pushing back first would make sense. Similarly, to go back we would first push forward slightly into the court before executing our drop step. We didn’t get time to properly go through an evaluation and process with these but I think all the coaches got the principles. Finally we had a quick look at Multi-Directional Speed and Footwork. Again, we were a bit rushed to go through a proper evaluation and process but we covered a few basic isolation drills. We did a tic-tac-toe drill for the footwork required to step out to a ball close to you. I like to encourage stepping out to a ball close to you with an open step. I suppose this makes sense as this is the opposite to sprinting to a wide ball using first step speed and a closed step! Then we finished looking at some basic drills for Multi-Directional Speed. I said that athletes needed to learn how to maintain an athletic position and got a coach to side shuffle in the service box while palming away tennis balls that I was throwing towards him. I also showed how I used various hurdle combinations to train the basic body positions for learning how to plant and cut. Hopefully next time I will do a similar format but spend less time on the presentation and spend more time getting stuck into the evaluations and the drills we can do to solve the movement problem. For those of you who were at the recent workshop as promised here is a review of the day. We tried to get through a lot of topics so it’s probably a good idea to take stock of what we went through by reading this Blog. For the first of our two part installment I will go over the key messages from the presentation. In the next installment I will go over the practical exercises. For those of you who weren’t there we had 14 attendees, 10 of whom were Tennis Coaches, 2 who were Tennis/S&C coaches and 2 sports studies undergraduate students who are aspiring S&C coaches. Therefore, the context for this presentation was the sport of Tennis! It was a 3 hour workshop and we started with an hour presentation. For me the key outcome of the presentation was to take the Tennis coach into the world of the S&C coach and get them to see human movement through the lens of an S&C coach. The great thing about working with sports coaches is that they will help us to keep focused on the bottom line, getting an improvement in performance where it counts, on the sporting arena, in this case the tennis court. And this means that we need to make sure that our physiological adaptations will actually positively transfer to improved sports performance either immediately or at some point in the future. Equally we need to help the sports coach realise that there are a number of ingredients that go into helping an athlete realise their body’s full potential to express their athleticism, and not all of the reasons why an athlete may appear to move poorly on the court have to do with a lack of basic speed and power. We talked about how if athletes have limitations in mobility that they will be unlikely to achieve the most desirable body positions to efficiently and effectively move. I showed the example above of an athlete carrying out an aggressive lateral cut and saying how important it was to have ankle, hip and thoracic spine mobility. Also, remember that proprioceptive stability is only effective at the ‘normal’ length-tension state in the muscle so if you force the body to get into a position (as can happen at speed in dynamic situations) your proprioceptors in the muscle could be compromised. If you think about the cycle of hitting a shot in tennis it ALWAYS starts with an action in response to something perceived in the environment. 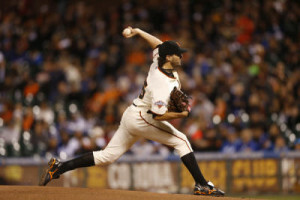 You act or ‘react’ to the movements of the opponent and the ball, you then run to stop and hit the ball in a balanced position (or unbalanced position) and then have to time the segments of the body’s kinetic chain to produce the force (stroke production) at the right time. The Tennis coach is the best person to develop the skills of reaction, balance and coordination as they relate to hitting the ball. Having said that, even though skill is traditionally thought of as the domain of the sports coach targeting these biomotor abilities in S&C sessions makes it easier for athletes to acquire the skills of their sport. We are assisting the athlete to better organise their bodies by developing their senses especially vision, and proprioception. Dynamic balance (stability) is reflex driven hence why balance exercises build upon postural corrective exercises. As well as doing all the physio type ‘activation’ exercises to correct poor static posture we need to do lots of jumping and landing and running and stopping to develop an ability of the proprioceptors to help us manage the body’s constant shifts in centre of gravity during dynamic tasks. Coordination is focused on the timing of the movement to get the correct body parts to fire in sequence. Remember that every sport has a unique motor programme (technique) that is built on a basic coordination foundation. We can perform get the athletes to perform all sorts of movement puzzles that require good timing such as running to jump and catch a ball in the air or performing sequences with the feet and hands. I finished discussing skill by making the point that these qualities are REFLEX DRIVEN meaning they are developed in response to changes in the landscape of the environment. I used to believe that my role as a coach was to make my athletes look good; now I believe it is to challenge them to take them to the point where they struggle. Beginners will be fine to start with predictable and pre-planned movements because they will bring their own inherent unpredictability to the party. Think of the task of riding a bike going from doing it with stabilisers to doing it without. But as soon as possible take the stabilisers off and let them discover how to solve the movement problem. This is a metaphor for good coaching practice! Challenges like this will require Mental effort. There is a clear Intent to stay on the bike and the Attention should be kept on external focuses such as avoiding obstacles. This is called ‘Discovery Learning.’ The opposite is known as ‘Teaching’ and would focus on internal factors such as where to hold the handles, how to shift your weight on the bike and how fast to pedal etc. There is a place for both. I make a case for doing more learning and less teaching. Kudos goes to Duncan French who put me onto this. We know that perhaps more than any other factor, strength is the biggest player when it comes to being athletic and specifically being fast. Force into the ground is what causes acceleration (A=F/m) so bigger forces at the same body mass cause bigger accelerations! You need force to overcome your own inertia but you also need even more force to overcome your own momentum and stop! The qualities of force and rate of force development are where the S&C coaches really can take the lead on. Just remember, those adaptations need to help develop better performance on the sporting arena somewhere down the line. And leads nicely to my last point and that is something that I think we should be clear on; how we work together to develop athleticism that actually transfers onto the court. I think there needs to be an honest assessment of the skills that each member of the team brings to the party. Some S&C coaches have a very vast sport specific knowledge base (and consider themselves a sport specialist), others may be limited in their technical understanding of the sport. This works for Tennis coaches too; some have different levels of technical knowledge of their sport and different levels of S&C knowledge. At the end of the day there is no single solution, every team and athlete brings different challenges. But there needs to be joint accountability and the best interventions are always the ones that are followed through on together.